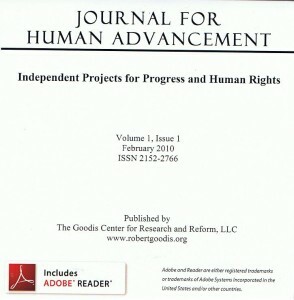 Please refer to the Submission Guidelines on this page when submitting content for the Journal for Human Advancement: Independent Projects for Progress and Human Rights. You can download a copy of the submission guidelines using the link beneath the embedded PDF. We also welcome inquiries and proposals. To submit an inquiry or proposal, please follow the same general guidelines, but include a description of your anticipated works and a sample of prior works for reference. 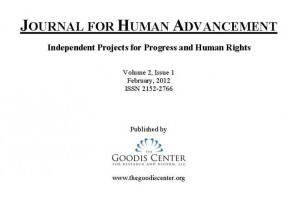 To purchase issues of the Journal for Human Advancement, check our Services and Products page. Both CD and digital download editions are available. Volumes 1 and 2 are currently priced $3 per issue for the CD edition. The digital download will be posted shortly with the option to pay by sharing to social media. Stay tuned for updates to our pricing and subscription rates. This information will become available in the near future after our publication schedule is more stabilized. The Goodis Center for Research and Reform, Inc.
As a small nonprofit, your support makes our programs possible. We welcome volunteers, freelance contributors, and pro bono professionals. Learn more about how you can get involved with The Goodis Center here. We are also grateful for your financial support. Except where otherwise noted, the following materials on this site are licensed under a Creative Commons Attribution-NonCommercial-ShareAlike 4.0 International License: curricula, training materials, informational brochures and info sheets, infographics, and interactive content.